I came to Legion from the X-Wing Miniatures game. And in X-Wing, determining the winner of a game was extremely simple: whoever scored the most points at the end of 75 minutes won the game. How did you score points? By blowing up your enemy. The objective was always clear: I need to do more damage to my opponent than they can do to me. Sometimes, that meant doing more damage faster, and sometimes that meant preventing them from doing damage. Two sides of the same coin. And so if you’ve done your homework into Legion, you know what comes next: the difference, the novelty. Legion, like most war games, doesn’t just ask you to kill the encroaching enemy. It asks you to accomplish an objective, and then it tells you whether or not there will be complications standing in your way. Because of this, no two games of Legion play the same. Even with the exact same armies clashing time after time, the total product of terrain placement and choosing distinct deployments, conditions, and objectives creates something entirely new. If you’ve come from a game like X-Wing or even just traditional video games, this will feel like a breath of fresh air. So what does this look like on the battlefield? Let’s explore some of the three different card types (collectively known as the Battle Cards) you will face as you begin your first few games of Legion. First, we’ll look at Deployment cards, which determine where your minis and your opponent’s minis will be placed on the board. 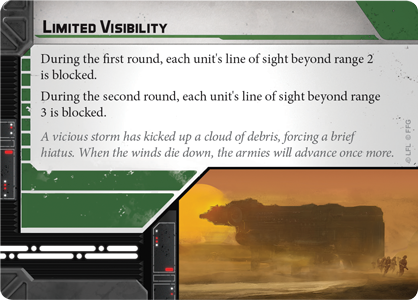 In X-Wing, there is only one type of deployment: within a range 1 ruler’s length from your edge of the board, which is opposite your opponent’s edge. You can move side to side, but there always be direct opposition in your placement. And, to be sure, this exists in Legion. 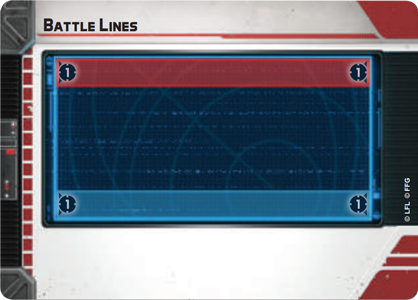 It’s called Battle Lines, and is perhaps the most newbie friendly deployment. Or maybe you draw Advanced Positions, which puts your deployment zone at a ninety degree angle. You and your opponent could end up within a stone’s throw by turn 2, or you could place yourselves on the short edge and spend the next few turns plodding up towards the middle. Choosing the best deployment that synergizes with your list is a vital step towards winning the game before it even begins. Wondering what those numbers within the deployment zones mean? It’s to help you measure it out in the board, using your range ruler. Advanced Positions, for instance essentially has two overlapping sections that are range 1 high, and two range 3s long. Along with deployments, you and your opponent will choose a card that determines the environmental board state. Not only does this help in your overly grandiose, half-drunk recollections of particularly epic games, it also can have a serious impact on how your units interact with the board. 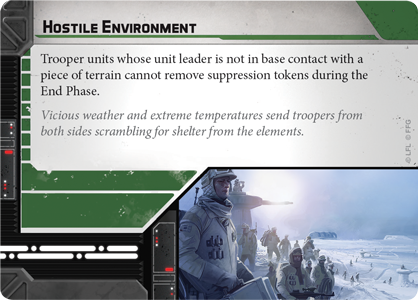 For instance, Hostile Environment (with that beautiful Hoth imagery) dictates that any trooper unit whose unit leader is not in base contact with a piece of terrain at the end of a round is not given the opportunity to remove one suppression token as they normally would. Suddenly, moves through open space are even riskier. But perhaps you like things to be perfectly simple, or are trying to learn a new list. Well, there’s a card for you, too. And finally, we come to the game-defining choice of the objective. 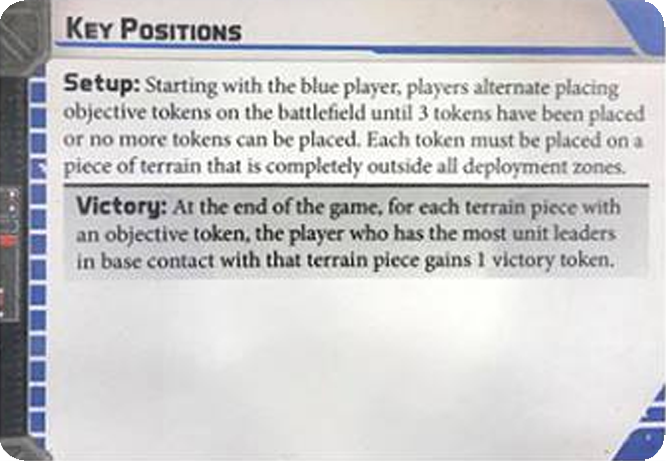 The basic idea of each objective card is this: do X thing, and get X victory tokens (different jargon-wise from points, which determine how big your army is or how much your units are worth) for it. 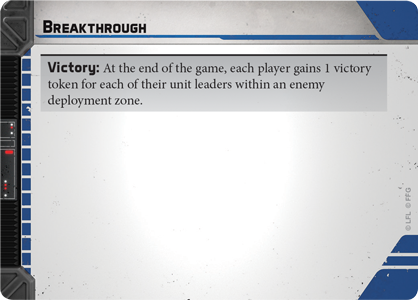 Where the only rule is that you get 1 victory token for every one of your unit leaders that makes it to an enemy deployment zone at the end of the game. 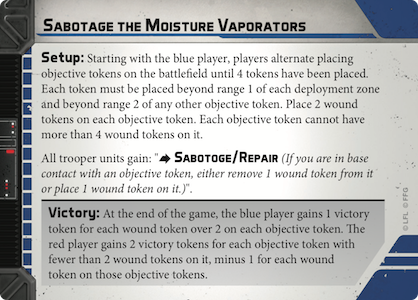 In which you and your opponent engage in a delicate dance of sabotaging or repairing four moisture vaporators placed around the board, and only Trooper units can engage with the vaporators themselves. It also means that even if your opponent has picked off half of your minis, if they aren’t playing the objective they’re still at a major risk of losing the game despite having the numbers advantage. It’s tricky, and requires both coordination and a well-matched list. Once the cards are laid out, you take turns with a limited veto. You can, on your turn, choose to eliminate the leftmost card in any row or pass. Once all four vetos (two per side) have been completed or passed, the leftmost card in each row becomes the Condition, Deployment, or Objective for the rest of the game. So, for instance, both players could pass twice each, leaving the three leftmost cards as the defined battlefield. 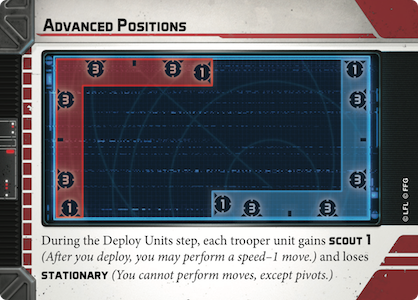 Alternately, you could both choose to eliminate the leftmost cards in the Deployment and Condition on both turns, leaving the two rightmost cards as the battlefield in those rows and the leftmost card for the Objective row. The only other stipulation is, not surprisingly, that you can’t eliminate the final card in any row. You need one of each to play! And this is where strategy comes into the fold. Take a look at the leftmost condition, Limited Visibility. 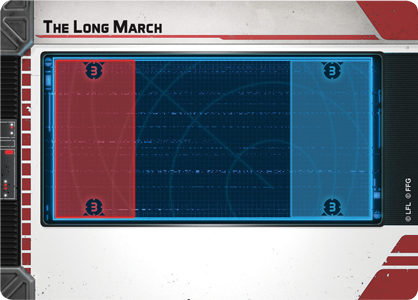 The card says that during the first round, each unit’s line of sight is blocked past range 2. And during the second round, it’s blocked past range 3. 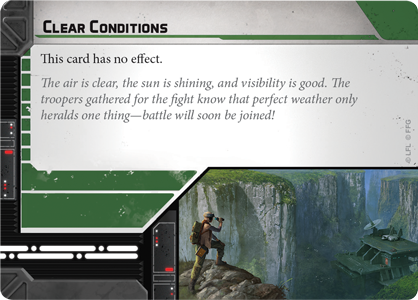 If you’re an Imperial player with Veers (and his Maximum Firepower command card, giving him an extra Range 4 – infinity attack) and two AT-STs (both with mortar launchers which have the same range), you desperately want to avoid that condition. You might choose to eliminate it with your first turn. Or say you’re a Rebel player who’s chosen to only have one commander: Luke Skywalker. 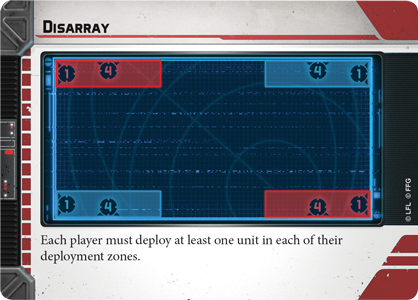 The second deployment card, Disarray, could force your troops into opposite corners, leaving them outside Luke’s range 3 command bubble. They’d be unable to receive orders and left vulnerable to panicking. You might want to nix that card if you have the chance. There’s never going to be one right way to choose your cards. The best fit is going to depend on the terrain, your army, and your own playstyle. So it’s okay if you don’t know which ones to choose right away. Over time, you’ll develop a feeling for which ones work best for you and your units. But no matter what cards you pick, know that you’re in for a fun and varied game every time you unpack your minis and reach across the table to shake your opponent’s hand.